A center dedicated to young children, an empty dining room and a community full of vibrant older adults? Put them together and you’ll find young and old enjoying a favorite book or holiday celebration with sweets and treats. 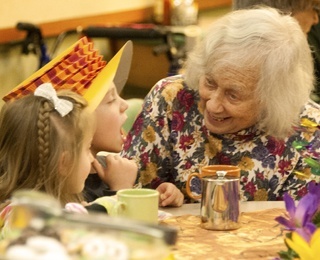 Welcome to Kendal at Oberlin, where intergenerational activities are firmly planted and continue to grow. In 2013, Kendal accepted a Shared Site award with the city of Oberlin from Generations United for its exemplary programs that bring older adults together with young people and children. Kendal, like many other life plan communities, recognizes the many benefits of intergenerational relationships for older adults. One way for older adults to combat isolation is to stay engaged with others, especially children and younger adults. With families scattered across the country and world, grandparents can’t always depend on regular, face-to-face interaction with their children and grandchildren. Intergenerational programs and volunteer opportunities help bridge that gap. Lisa Wilken, manager of Kendal’s Langston dining room, completed a leadership training program in 2015 that urged her to cultivate passion for a project. 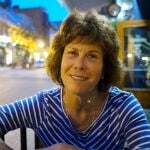 Lisa thought about lonely diners, and those with Alzheimer’s. “Watching someone in a full state of dementia come alive because of a child is really neat,” she said. She also wanted to encourage more interaction between independent residents and those needing assistance. A handful of people, both residents and staff, met to brainstorm. The result? Another Kendal intergenerational program. For the Mad Hatter Tea, children made hats, staff baked cookies, the resale shop donated plates and saucers, and residents dressed in costume. Organizers were guided by residents Rachel Fordyce, an expert on “Alice in Wonderland,” and Donna Baznik, an Early Learning Center volunteer. About 80 people attended, including several residents from the care center. “That set the bar,” said Lisa, already looking for the next big event. Called “Ars Moriendi: Death and the Art of Dying,” the Oberlin College freshmen course is about living life to its fullest. To make sure that happens, Professor Jed Deppman matches students with a life-filled adult, a Kendal at Oberlin resident. Now in its 12th year, the course is also a boon to residents. 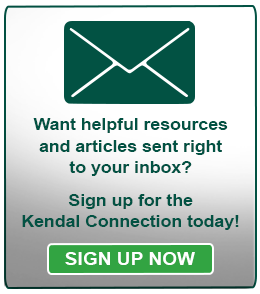 “At Kendal we are always finding ways to keep in touch with the vital, intelligent, lively community of young people. This course provides a catalytic driver for both sides – it’s fertile interaction,” said resident Bob Longsworth, who has participated in the program several times with his wife, Carol. Students email or call the resident to arrange a time to meet. (And don’t just stop over, expecting the resident to be sitting around, Michele jokes.) The pair is expected to meet at least an hour weekly, but often visits last longer. The Longsworths, for instance, go bike riding and visit the Allen Memorial Art Museum with students, and invite them for dinner. At the end of the course the students and residents gather for a potluck. “Everybody felt they grew as people. We could talk with kids about things they couldn’t or didn’t want to talk about with their parents,” Kendal resident Allen Huszti said. There are lots of volunteer opportunities that involve children and young adults. Ask your local school, hospital, library or United Way for suggestions. Join a club, sign up for a class, or consider a life-changing experience, such as moving to an intergenerational community like Kendal.